A once in a lifetime discovery of a treasure trove filled with artifacts left over from the days wooly mammoths roamed the Earth beside early man. As construction workers were preparing to lay the foundations for a new mall, they unearthed a treasure trove of ancient artifacts. Upon examination, the stone tools were revealed to be nearly 10,000 years old. What is truly spectacular about the discovery is that it illuminates a prehistoric time when wooly mammoths roamed North America alongside our human ancestors. Very few other artifacts from this time period have ever been found. Thanks to modern science traces of bison, deer, bear, sheep and salmon could be found on the tools. This as well as the pieces of salmon bone found amidst the tools mean that the fish made their great migration upstream even 10,000 years ago. 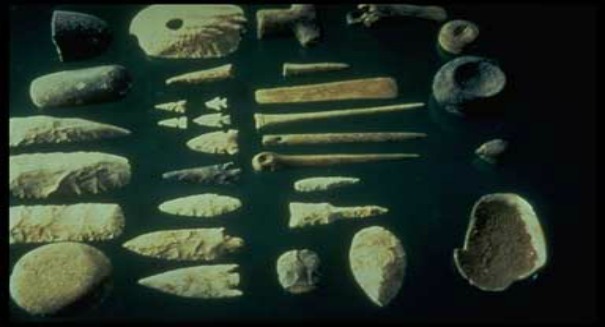 All told, approximately 4,000 man made items were found including scrapers, spear points, flakes, awls, and cobbles. Many of the tools have unusual concave builds. The archaeologists believe that the people living in this area were craftsmen of sorts, building and repairing the stone tools of others. The tools were preserved beneath a layer of peat over a foot thick. The peat is believed to be all that is left of an ancient bog which formed sometime after the craftsmen lived there. “It’s hard to find this kind of site west of the Cascades, because it’s so heavily vegetated and the Puget Lobe of the big ice sheet really affected the landscape,” said Kopperl. It was only through sheer luck that the cache was uncovered. The home of the new Redmond Town Center mall had to be resurveyed in accordance with Washington’s efforts to restore salmon habitation along the tributaries of the Sammamish River. Once Kopperl and the other scientists are done examining the tools, they will return them to the Muckleshoot Tribe, the most probably decedents of the ancient humans who lived in the area. Kopperl’s analysis of the artifacts is published in the Journal PaleoAmerica.